This Hoover Upright Vacuum Cleaner combines money saving efficient motors with great features, achieving an A rating for energy. Suitable for carpets or hard floors, Vortex has a hygienic easy empty 2.5L bin. You can also clean above floors, thanks to the 2.5m hose and tools, including a powerful pets turbo brush. 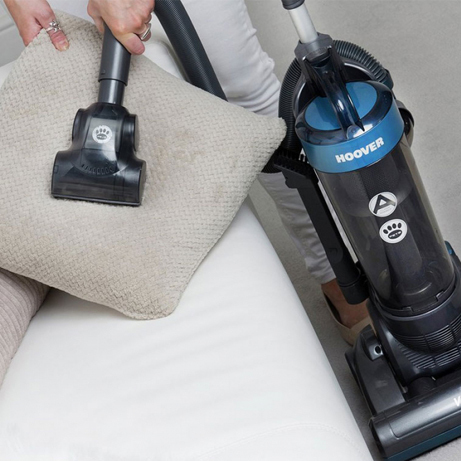 With 750 watts of power, this Hoover vacuum cleaner has plenty of power to get the job done, thoroughly and efficiently. It also offers excellent performance on both carpets and hard floors making cleaning throughout your home a doddle. We all love our four legged friends, however leaving fluff and hair all over your floors is definitely a downside. Luckily, Hoover has equipped this with a Pet Turbo Brush. This powerful attachment is great at picking up fur and fluff from around your home. 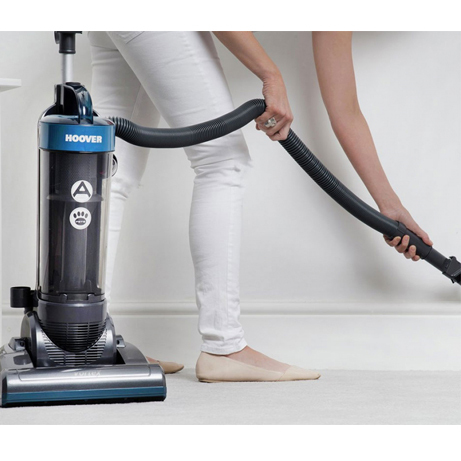 The Vortex makes vacuuming much more convenient, thanks to its modern design. 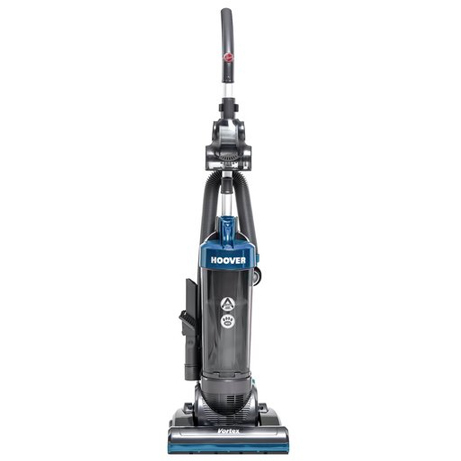 It has an impressive five-metre power cable, which gives you plenty of cleaning reach and flexibility. A lonerg cord means less swapping between sockets, getting the job done sooner. Cobwebs on the ceiling? No problem! Thanks to the 2.5-metre hose, you can simply detacht, pop on the handy attachment, and you’re good to go. Alongside the Pet Turbo Brush, you also get a two-in-one crevice tool and dusting brush. This is perfect for getting into those hard to reach places, cleaning surfaces and skirting boards as easy as possible. This vacuum doesn’t just perform brilliantly, it looks good too. A grey and blue colour scheme gives a stylish, modern look to this appliance. Not only does this vacuum cleaner help save you time, but it could help you to save energy too. With an A-class energy rating you can save money and reduce your impact on the environment.